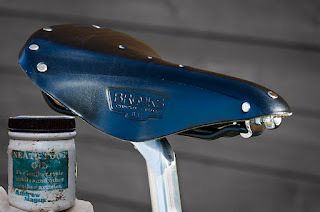 In order to speed up the softening process I am treating my saddle with Neatsfoot Oil. Neatsfoot oil is a yellow oil rendered and purified from the shin bones and feet of cattle. "Neat" in the oil's name comes from an old name for cattle. The oil is famed as a conditioning, softening and preservative agent forleather. In the 18th century, it was also used medicinally as a topical application for dry scalyskin conditions. But if my nether regions really suffer I think I will stick to Sudo Cream for that bit! As you can observe from the image, the bottle of oil has seen plenty of use already. The seatpost is a Nitto 65, one of the best classic looking seatposts around. Nitto are a brand legendary for their classic designs and flawless quality. Everything from Nitto is hand made in Japan to the highest standards. Nitto do not out source any part of production, they do not cut corners. With a 44mm rail and a single bolt system it is finished in anodized silver. And is the worn in Brooks saddle really as comfortable as something like a Specialized Avatar Comp Gel 155mm which is designed for comfort? My Brooks has only been rubbed with Neatsfoot Oil, as opposed to soaked in the stuff, and the wearing in process is still in rogress. In time ( how long?! ) I expect it to be more comfortable than the Specialized mentioned above. Reading the articles in the thread, I may switch to Proofhide as an alternative. and as I am now getting used to the new position I am adjusting my other saddles accordingly. I also read that having the saddle too low ( a problem on both the hybrid and vintage mercian ) can result in rider exhaustion occuring up to 12% sooner.